U.S. Steel is one of the largest domestic steel makers, and when steel prices move higher it will be in position to benefit. U.S. Steel (NYSE:X) has a long history, with internal projects like the "Carnegie Way" keeping the images of its storied past alive. However, the steel industry is cyclical, and the company has good years and bad ones. Last year was the fifth in a row in which the company lost money. But that could soon change, and quickly. Generally speaking, leverage is a function of debt, but there's another way a company can be leveraged. In U.S. Steel's case, it has high fixed costs because it uses blast furnaces. A blast furnace uses coal and iron ore to produce steel. Younger competitors use lower-cost electric arc furnaces, which use cheaper scrap, natural gas, and electricity. That puts U.S. Steel at a material disadvantage during lean times. For example, Nucor (NYSE:NUE), which uses electric arc furnaces, has lost money only once over the last five years (2009). It simply costs U.S. Steel more to operate its mills, which places a higher hurdle on the company. However, once it has covered its costs, revenues flow quickly to the bottom line. Source: Alfred T. Palmer, FSA-OWI, via Wikimedia Commons. How big of an issue is this? The company's gross margin was reliably in the high teens in the years leading up to 2009, the first year its bottom line fell into the red. Gross margin is roughly half of that now. However, when steel prices solidify, look for a quick return to robust profitability. Note that in 2008, this steel giant earned nearly $18 a share. Being leveraged to an upturn, of course, is only good if the markets in which you operate are turning up. And, for U.S. Steel, that's looking increasingly encouraging. The company's main business lines are flat rolled (roughly two thirds of the company's sales), tubular goods (16%), and Europe (17%). Europe remains a sore spot, but tubular goods have provided a solid underpinning of late. That's because tubular goods are generally sold to oil and natural gas drillers. With the massive increase in U.S. drilling, demand has been high. The only reason this segment hasn't been even better is that demand has drawn more competition from overseas steel manufacturers, so U.S. Steel is looking at flat performance here in the near term. However, the flat rolled segment sells to companies like auto and appliance makers and into the construction market. New car sales have been on the rebound for a number of years and recently hit an eight-year monthly high. And U.S. Steel's appliance customers are expecting a solid year in 2014, leading the company to project at least 4% growth for this industry in 2014. Construction, meanwhile, is also starting to recover, though it's still well off of the boom years. So, it looks as though the flat rolled segment is poised to take the baton from tubular goods and lead U.S. Steel's turnaround. Longer term, U.S. Steel is also taking steps to reduce costs. Right now it is self sufficient, or nearly so, in iron ore and coke -- key inputs to its mills. This allows the company to keep costs in check for often volatile commodities. However, that's now. The future will be more important when competitors like Nucor are using newer, cheaper technology. That's why U.S. Steel is talking about building its own electric arc furnaces. That would give it a combination of production methods, and, more important, allow the steel giant to reduce its costs. This, in turn, would both make it more competitive and make it easier to turn a profit. 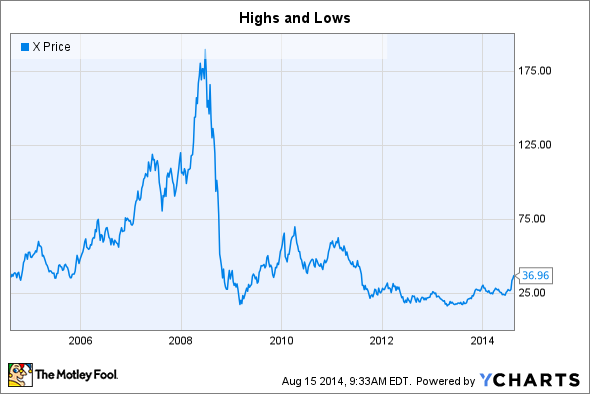 U.S. Steel's shares have moved up of late, but they remain well off of their 2008 peak. Although they may never reach such heights again, the run-up to that apex shows just how much opportunity there is here. Once the steel market begins to turn, and there are early signs that's starting to happen in key U.S. Steel markets, look for results to improve markedly -- and for investors to quickly become enamored of the company again.